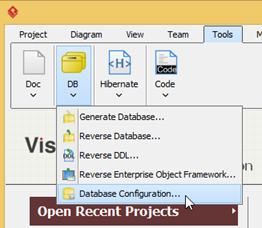 ERD Tutorial: How to Design and Generate SQL Server DB? 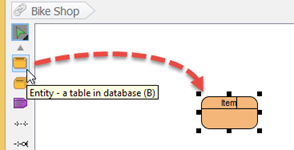 Current: ERD Tutorial: How to Design and Generate SQL Server DB? 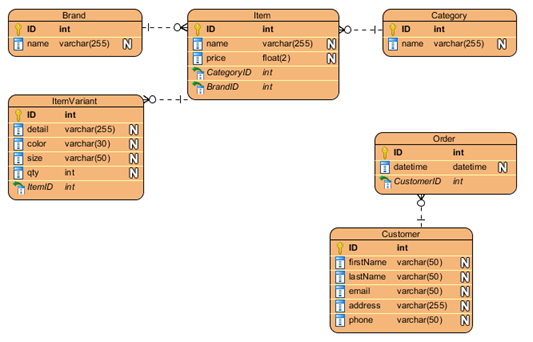 You can design database with ERD, and construct database by generating from the resulting ERD. 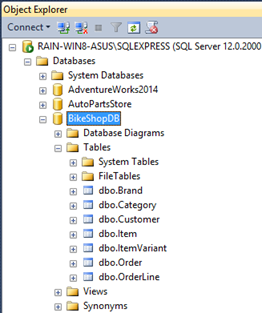 In this tutorial, you will draw a simple ERD of an online bike shop, define sample data for your database and generate database to Microsoft SQL Server from it. 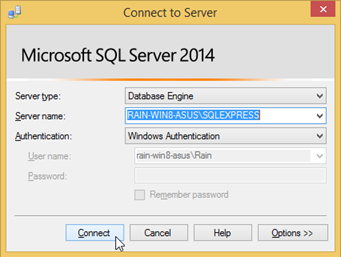 Visual Paradigm and SQL Server 2014 will be used in this tutorial. 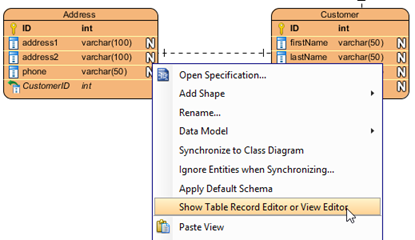 Right click on Databases root node in Object Explorer, and select New Database. 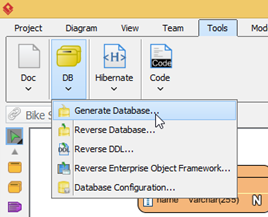 Name the database as BikeShopDB, and press OK to create the database. Once the database was created, we can then prepare our Visual Paradigm software for model your database. Go to Tools > DB > Database Configuration. 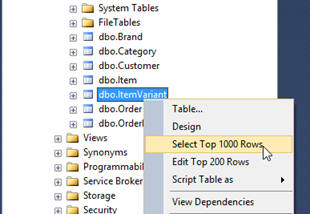 Select MS SQL Server in the database list. 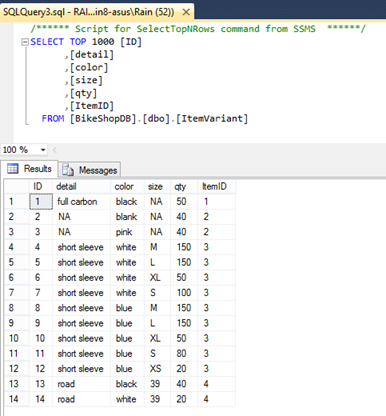 Select 2008 or higher in Version field (as we are using SQL Server 2014). 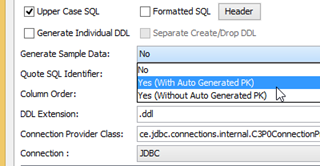 In this tutorial we will use the jDTS driver for establish connection with our database. Press the green arrow button next to Driver file field to let VP download the driver for you. If you wish to use other driver you can then simply select the appropriate driver in the Driver field, and press the ... button to locate your driver file from your local file system. Fill in the hostname or IP address of the machine which hosting your SQL Server in the Hostname field. And fill in the post number of your SQL Server instance in the Port number field. After that enter BikeShopDB in the Database name field, as well as your name and password for accessing the database. When finish enter the connection details, press Test Connection button to check everything alright. Now we are ready to start model our database in ERD. Let's start model our bike store database with ERD. 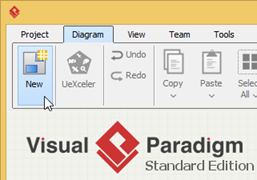 Go to Diagram > New to open the New Diagram dialog. 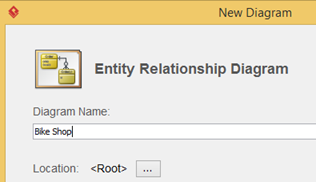 Enter erd in the search box to locate the Entity Relationship Diagram. Press Next to proceed. Name the ERD as BikeShop, and press OK to create the blank ER diagram. Select Entity from the diagram toolbar. Then click on the diagram to create an entity. Name it as Item and press Enter to confirm editing. Enter +ID : int and press Enter to create a primary key column ID with type as int. By default a new column will be created and in editing mode upon you confirm the previous column. Now enter name : varchar(255) and price : float(2) for the next 2 columns. Press Esc key on keyboard to stop editing of the Item entity. Every Item may contains various variations, i.e. a bike jersey will have different size and color. Let's create ItemVariant entity from Item entity with one-to-many-relationship. Move the mouse pointer over the Item entity. Press on One-to-Many Relationship -> Entity and drag it out. Release the mouse button and name it as ItemVariant. Now a link entity between Order and ItemVariant is being created. Rename the link entity to OrderLine. Now our ERD is ready and we can start define the sample data for our database. Select the entity Customer in diagram. 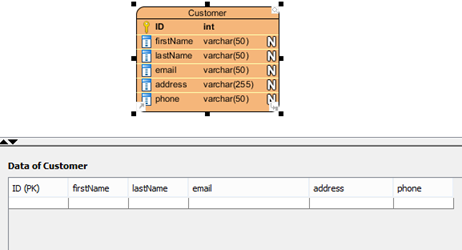 Now you will see the Table Record Editor showing the columns of the Customer entity. Let's move on to the Order entity. Since the Order must be ordered by someone, we can pick the Customer record when fill in the sample data for Order. Press the ... button in the FK cell in Table Record Editor. This will bring up the sample data we defined for Customer. Choose Peter form the list and FK value for Peter fill in for you in the Order record. Repeat the above steps to define the following sample data. Once everything is ready, we can then move on to generate the database. Select Database only in Generate. In Generate Database field, select Create Database. 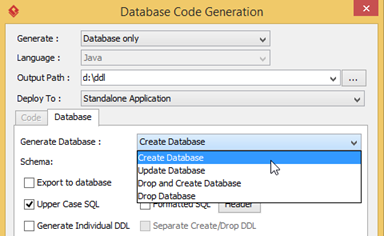 Select Export to database to let Visual Paradigm directly execute the DDL script to your database. In Generate Sample Data field, select Yes (With Auto Generated PK). 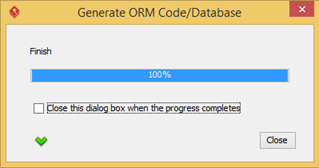 If everything is OK then we will see the progress dialog showing 100% complete. 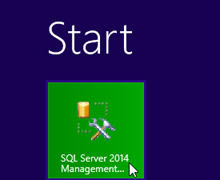 Now let's go to SQL Server Management Studio to review our database. Let's try to see what's inside the ItemVariant table. Right click on it and choose Select Top 1000 Rows from popup menu. And you can see the sample data are there.